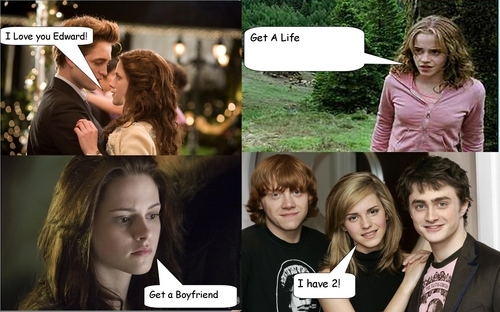 Hermione Vs. Bella. Hermione and Bella duke it out. HD Wallpaper and background images in the 哈利·波特与暮光之城 club tagged: hermione. This 哈利·波特与暮光之城 fan art might contain 标志, 海报, 文字, 黑板, 文本, 街道, 城市风貌, 城市环境, 城市场景, 城市设置, 肖像, 爆头, 特写镜头, 特写, and 爆头特写.